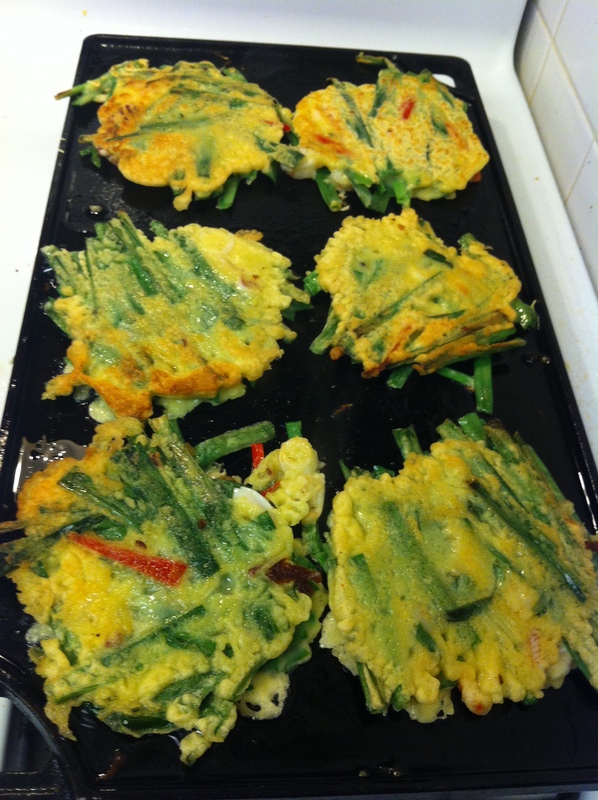 Over the weekend, my sister-in-law requested that I post pa-jeon (파전), or scallion pancakes. 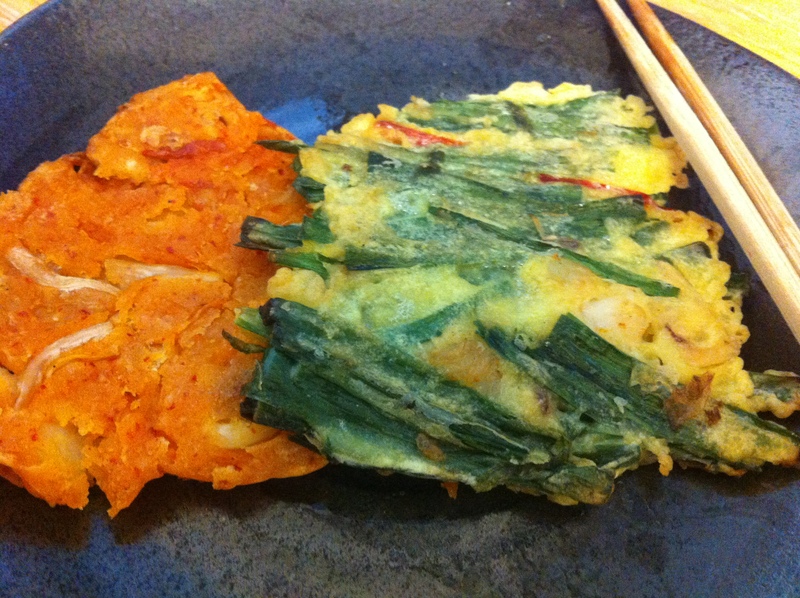 Unfortunately, I used all my scallions to make pa-kimchi (파김치, scallion kimchi) so I decided to make jeon or Korean pancakes with kimchi and boochu (부추, Korean or Asian chives). 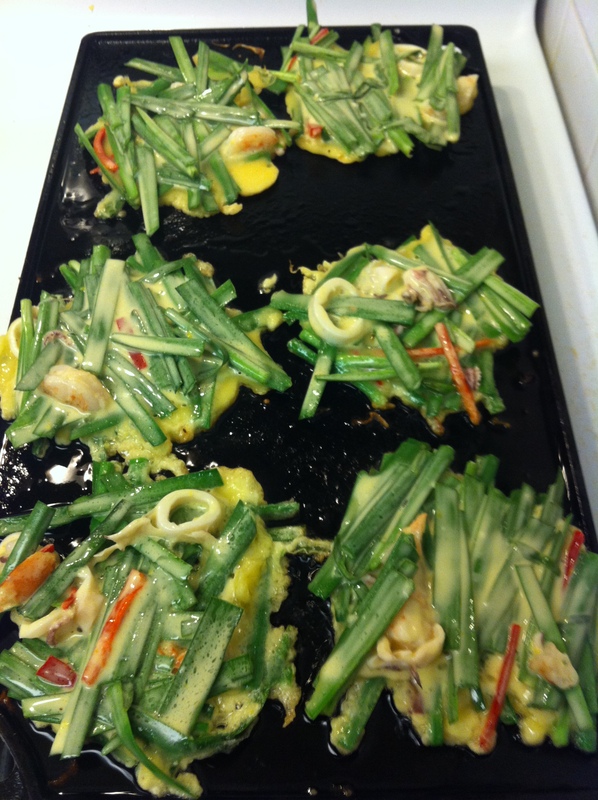 You can replace the boochu with scallions to make pa-jeon (파전). I added some squid and shrimp that I had in the freezer but this is optional for vegetarians or for those who don’t have or like seafood. 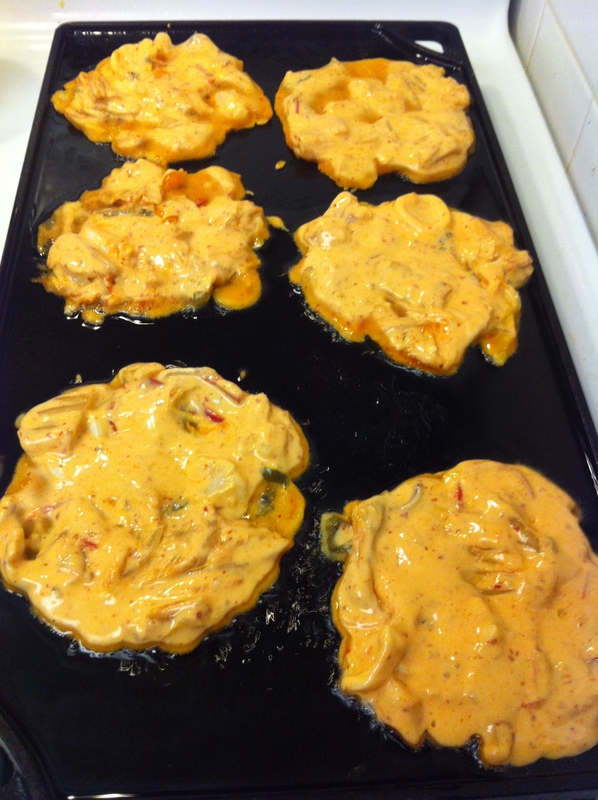 Another option is whether to add an egg in the batter or not. Traditionally, Koreans use egg in the batter but I personally found that it tastes fine without it if you prefer. It’s totally up to you. 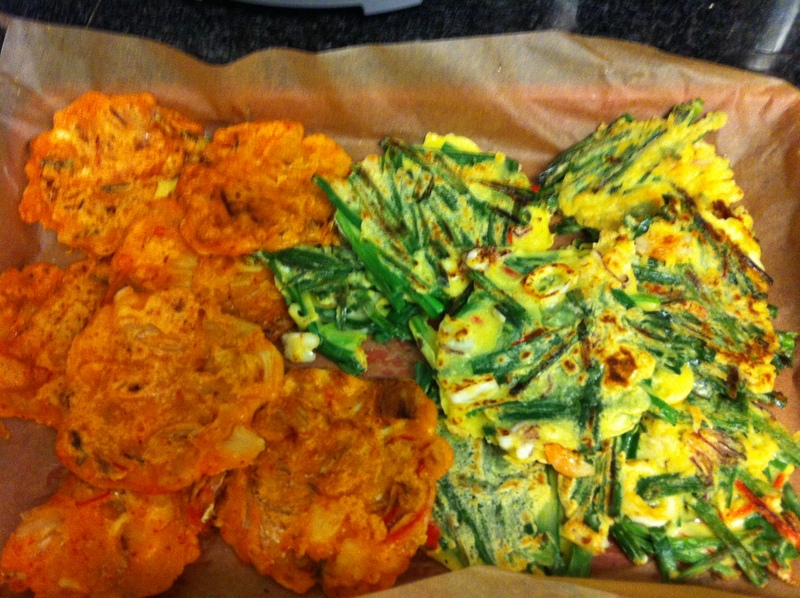 I did not use an egg for the kimchi-jeon but used one for the boochu-jeon. Additionally, I added about 2 tablespoons of potato starch to the batter. This makes the jeon more crispy. You can replace the potato starch to corn starch or omit the starch all together. Cook the seafood in boiling water for about 3 minutes. Rinse in cold water, drain and cut into small bite pieces. Cooking the seafood ahead helps the pancakes get crispier but you can all raw seafood directly into the batter if you are pressed for time. 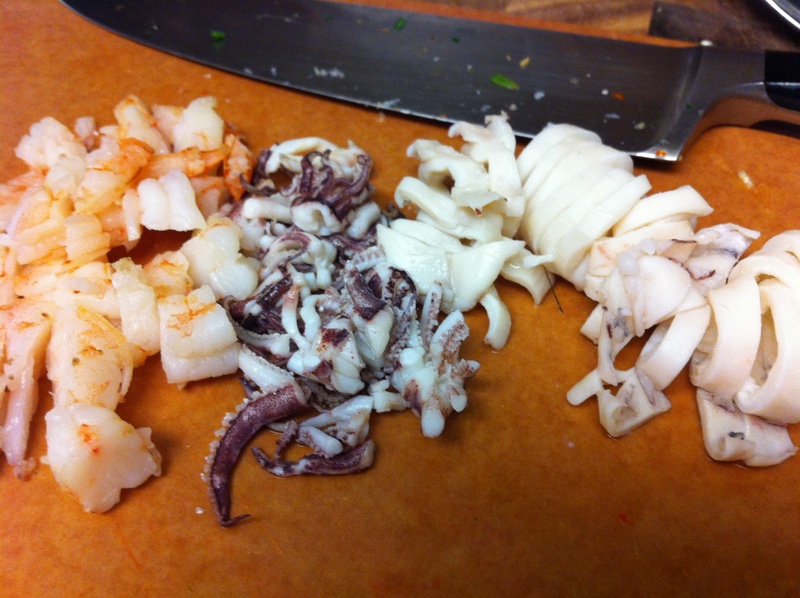 Split the seafood into half so you can use 1/2 in the kimchi-jeon and the other in the buchu-jeon. 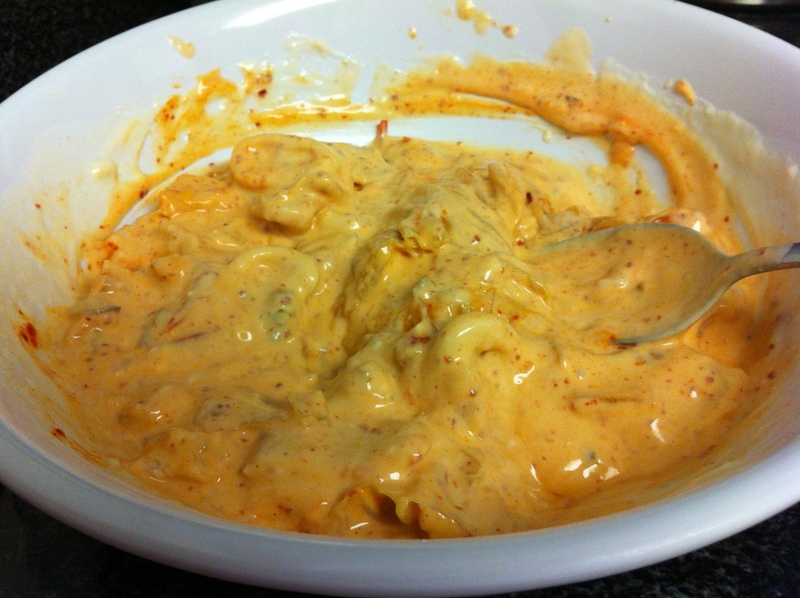 Mix the kimchi with agave syrup (or sugar) and sesame oil. Heat a large skillet or griddle on medium-high heat. 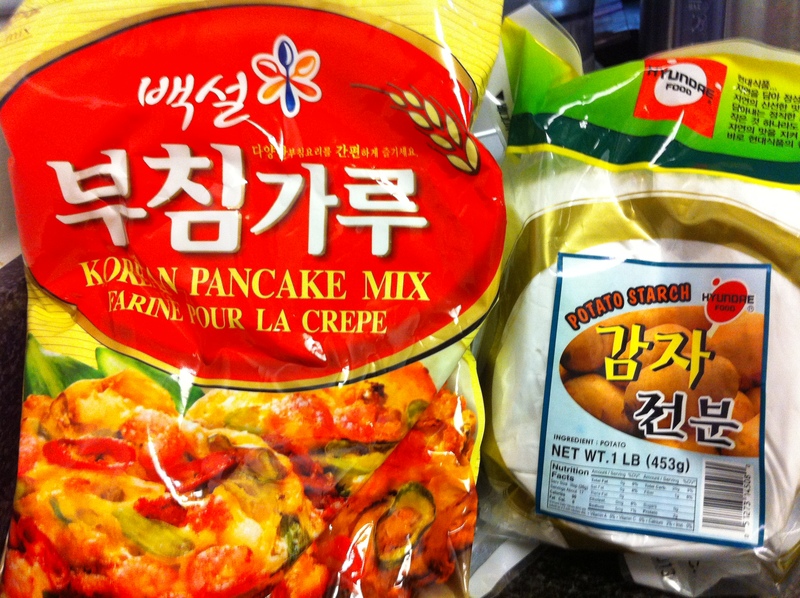 Mix the Korean pancake mix (buchim-garu, 부침가루) with 2 tablespoons of potato or corn starch. Add ice cold water to the dry ingredients. Mix well to make the batter. 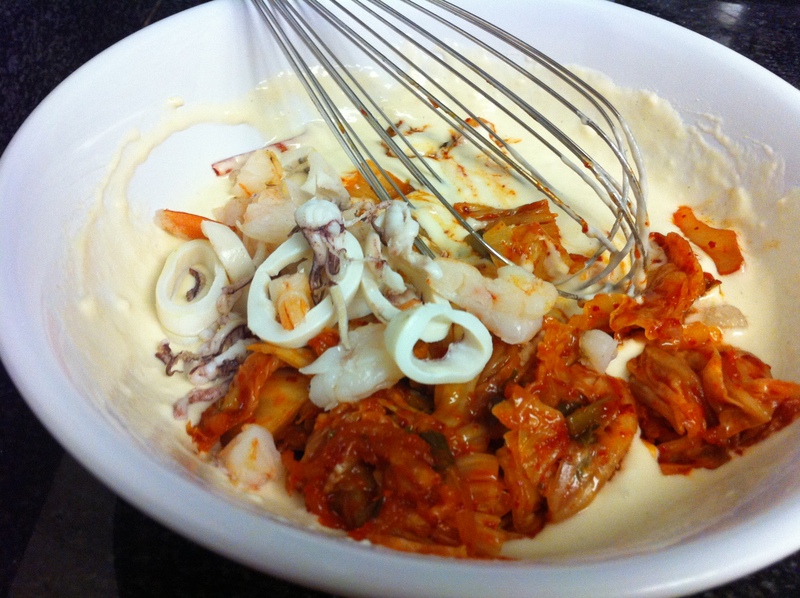 Mix in the seafood, red chili and kimchi and stir. Drizzle oil about 3-4 tablespoons of oil on the skillet or griddle and spread the oil evenly. Spoon the mixture and shape it into a round shape. The size of the jeon is completely up to you, large or small. Flip the jeons when you see the edges browning, about 3-4 minutes later. 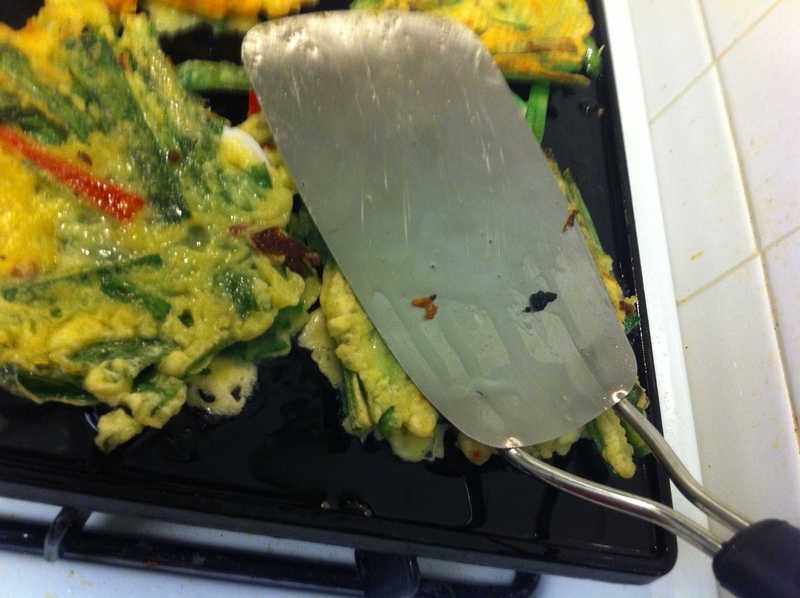 Press the flipped jeons with your spatula. This helps the cooking process. When each sides of the jeons are golden brown, remove them to a plate. Repeat the process until you cooked all the batter. Serve with a soy and white vinegar mixture. The ration for this sauce is soy sauce: vinegar= 4:1 or 3:1. 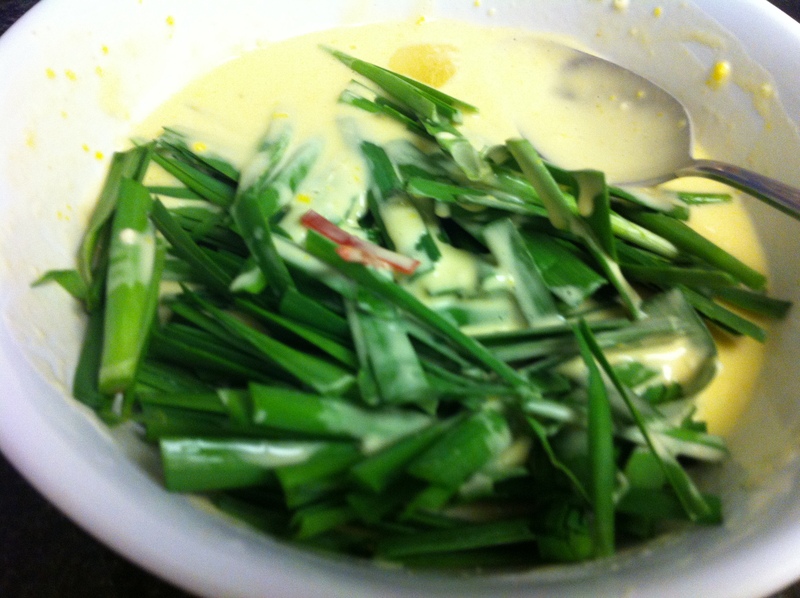 Cut the cleaned boochu or Korean chives into about 3 inch (7cm) pieces. Add the egg and ice cold water to the dry ingredients. Mix well to make the batter. Mix in the seafood, red chili and boochu. 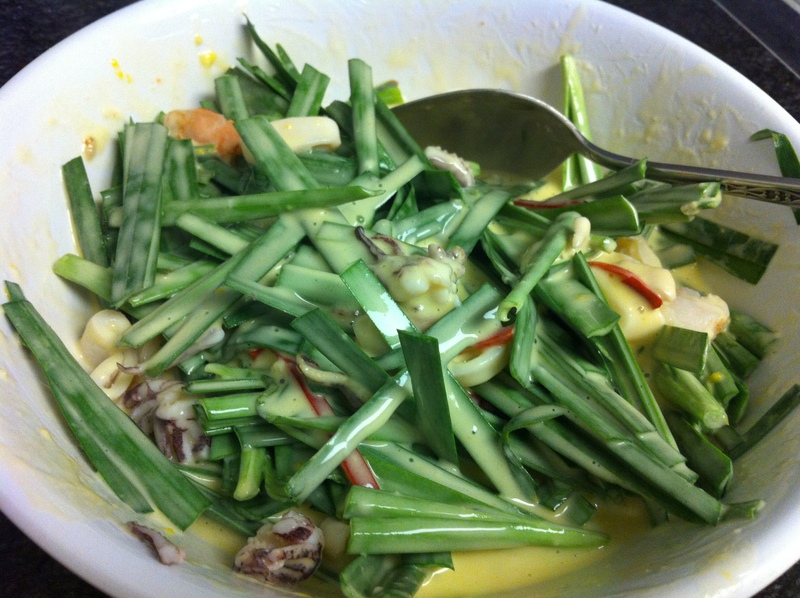 Gently stir the mixture with a spoon so the chives do not get bruised. You will notice that the batter in just enough to coat the chives and seafood, which is perfect. 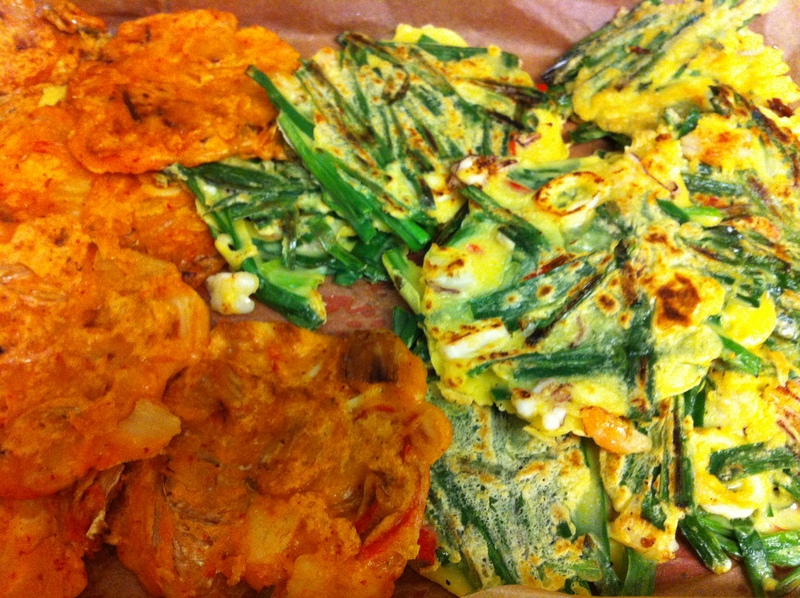 This entry was posted in Appetizer, Banchan (반찬, Side Dish), Good for dinner, Good for lunch, Main Dish, Seafood, Vegan/Vegetarian Options and tagged Boochu, jeon, Kimchi, Korean Pancakes by gangnamkitchen. Bookmark the permalink.